DropStop® fits into every wine bottle neck, due to its flexible design. Simply roll up the disk and pop into the neck of the bottle. 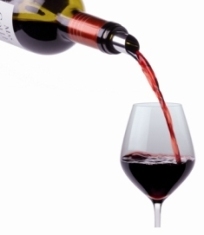 Pour wine without spilling a drop. The DropStop is made from layered laminate (PET and aluminium) and is 100% food grade. So it doesn’t matter how many times you use the disc is remains completely safe. Use your DropStop for years to come. Keep clean by rinsing under hot water. What is the DropStop® made from? Produced from a multilayer consisting of polyester, polypropylene and aluminium, the DropStop is laminated to meet general food grade standards. Available in either Silver or now GOLD foil – find out more about the new gold DropStops here. Can I print DropStop® with my logo or design? Yes, printed DropStops are our speciality! 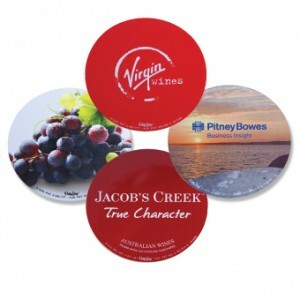 In fact DropStop® is the first company in the world to be able to offer four colour laminated printing via a new process which ensures no contact between the printed inks on the circular drip free pouring discs and the alcohol in the bottle. What is the minimum order quantity for printed DropStop®? The minimum print quantity for the Drop Stop is 250pcs. We can produce printed DropStop with your logo in either Black or full colour CMYK. To buy plain DropStops please follow this link. How long does it take to produce printed DropStop®? The lead time to produce and deliver printed Drop Stops is from 5 to 21 days depending on the quantity and choice of packaging. Where is the DropStop® manufactured? Made in the EU to food grade requirements, the Drop Stop is produced exclusively in Denmark and protected by patents worldwide. What are the packaging options for printed DropStop®? We offer several different packaging options for the Drop Stop. From retail-friendly Euro hooks to on-bottle neck hanger promotions the DropStop has a packaging option to suit every need. For full details on printed DropStop packaging options follow the link. Can DropStop® packaging be customised? The majority of Drop Stop packaging can be printed with your logo as well in full digital CMYK colour, from as few as 250pcs. How does artwork for the printed DropStop® need to be supplied and what if I don’t have artwork? For digital print artwork is required in an EPS (vector) format. This could be as a PDF file, an AI file or other vectorised formats. If you don’t have a logo or artwork in a ready made file, don’t worry. Our in-house design team will be able to help you create the perfect logo for print. How can I order printed DropStops®? If you are interested in having branded DropStops produced with your logo simply drop us an email sales@waitersfriend.com or fill in the enquiry form and let us know how many you would like, how you would like the DropStop to be printed and your preferred packaging option.